Newport Beach and Huntington Beach, Calif., in stalemates over the removal of bonfire pits. California surf havens Newport Beach and Huntington Beach are known for beachside bonfires, but concerns about air quality may snuff out those familiar flames. A study conducted by the Air Quality Management District (AQMD), the air pollution control agency for all of Orange County and the urban portions of Los Angeles, Riverside and San Bernardino counties, found that smoke produced by the pits poses a health risk to local residents, particularly children and the elderly. The organization therefore proposed that all fire pits should be removed, according to the The Associated Press. 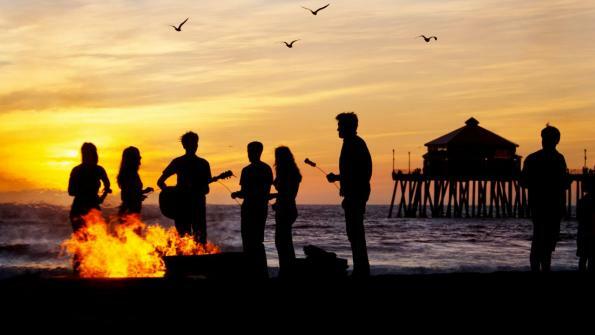 In the wake of the findings, Newport Beach applied to the California Coastal Commission, which plans and regulates the use of land and water in the coastal zone of California, to remove its 60 wood fire pits. The application was rejected because the pits are beneficial to the local economy, according to CBS Los Angeles. A debate now rages about whether or not the pits should not only remain in Newport Beach, but in Huntington Beach as well. Proponents of removing the pits worry about the quality of the air in their community. Wood smoke contains toxic, cancer-causing chemicals as well as common combustion pollutants such as nitrogen oxides. Of greatest concern are microscopic soot particles that can lodge in the lungs and, in some cases, pass through cell linings to the bloodstream and reach other organs, according to the AQMD’s website. “There’s a part of me that says I’m glad the data confirms what our physical experience has been, and then there’s the other part of me that says, ‘Oh my Gosh, I’m living with this unhealthy air quality on a day-to-day basis',” Barbara Peters, a resident of Newport Beach told CBS Los Angeles. Local politicians are joining the fight to keep the fire pits, claiming that the pits are an important part of the area’s culture. "We're going to see these bonfires continue for years and years," Assemblyman Travis Allen (R-Huntington Beach) told NBC Los Angeles. "We've had them for 60 years here in Southern California. This is a tradition that everyone associates with our beach lifestyle." While Newport Beach and the AQMD maintain that the fire pits pose an unnecessary risk, the removal of these pits could represent a significant loss in tourism and revenue for Huntington Beach, as the Huntington Beach Visitors Bureau claims the bonfire pits bring in about $1 million in parking fees from beachgoers. While the preliminary study showed that the smoke did pose a health risk, the levels of pollution vary depending on the weather, and the scheduled June 7 vote has been postponed until further testing can be completed. Give me a break. Another California / Orange County pollution problem extreme. The smoke levels and pollution have to be significantly reduced and dissipated before they can reach any residences in the area. Next these same residents will be looking for a way to make an issue of the forest fire contaminates that may blow hundreds of miles to where they live.